New Garden Friends Meeting celebrates and welcomes families of all descriptions. Childcare is provided for infants and toddlers during First Day Forums and Intergenerational programs at 9:30 a.m. each Sunday. Childcare continues for the 11 a.m. semi-programmed Meeting for Worship. Preschoolers and older children are welcome to sit with their parents. Preschools also may join with other young children on the quilt at the front of the meeting room. New Garden offers a special place for pre-school Friends to gather at the 11 a.m. Meeting for Worship each Sunday. 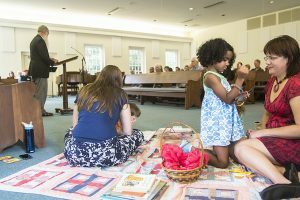 A quilt is spread at the front of the worship room, where caregivers supervise the children as they pursue quiet interests until silent worship begins. New Garden Friends Meeting celebrates and welcomes families of all shapes and sizes. Semi-programmed worship, at 11 a.m. each First Day (Sunday), is designed for Friends of all ages to be present. We understand that some of our smaller Friends better experience Meeting for Worship with a little more movement. For these younger Friends, there’s a blanket at the front of the meeting room. Children may gather here with New Garden’s adult caregivers for “Meeting for Wiggles.” After about 30 minutes, as the Meeting room settles into worshipful silence, the children and caregivers exit. Children, of course, also are welcome to sit in the benches with their families. If either scenario does not work for your family, childcare is available. Please choose the option that best suits your needs. We understand that life is busy! Families may not be able to make it to Meeting every Sunday. But that doesn’t mean you cannot be deeply committed and bonded to a community. We hope that community can be New Garden Friends Meeting. Keeping this in mind, New Garden offers a less traditional format for its First Day School classes. Intergenerational First Day School is an opportunity for Friends of all ages and abilities to explore Quaker history and values and Bible stories together. Our mission is to build relationships across ages and perspectives through discussion, play, arts and crafts, stories, and service projects. We believe that a diverse offering of First Day School programs helps us warmly welcome all people into our Meeting community. We strive to make things as easy as we can for families. So please come as you are. And don’t worry about breakfast. Intergenerational First Day School includes breakfast, and it’s just part of the fun! Tell us your interests and we will be in touch with you very soon. 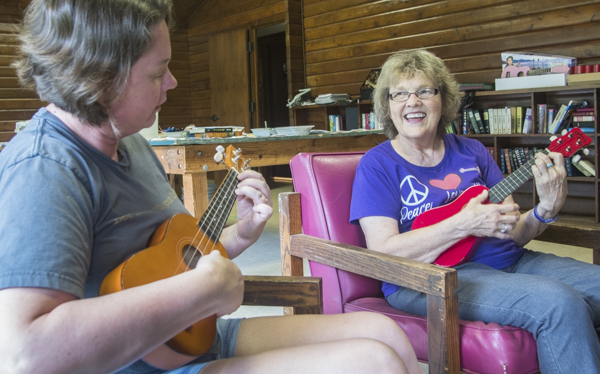 Family Camp usually takes place on Labor Day Weekend, when New Gardeners of all ages head to Quaker Lake Camp in southeastern Guilford County. 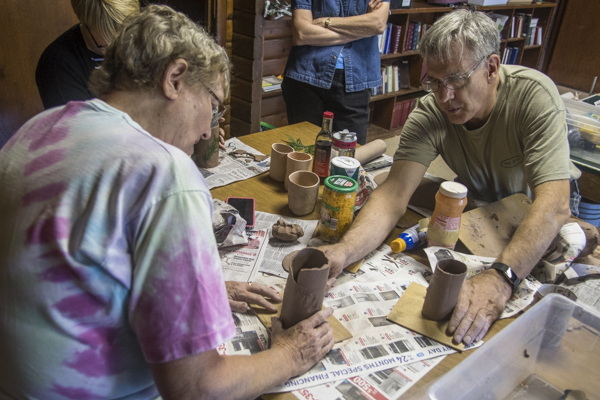 During this time of fun and fellowship, families and individuals in the New Garden community cook together, eat together, do chores together, take nature walks, enjoy crafts, sing, swim, chat, nap, and play trivia games far past Quaker midnight (9 p.m.). On Sunday morning, there’s unprogrammed Meeting for Worship in a shelter overlooking two tranquil ponds. 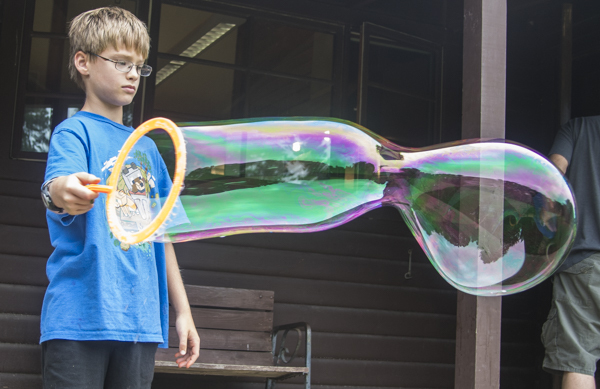 Old relationships are strengthened and new friendships are made each year at Family Camp. 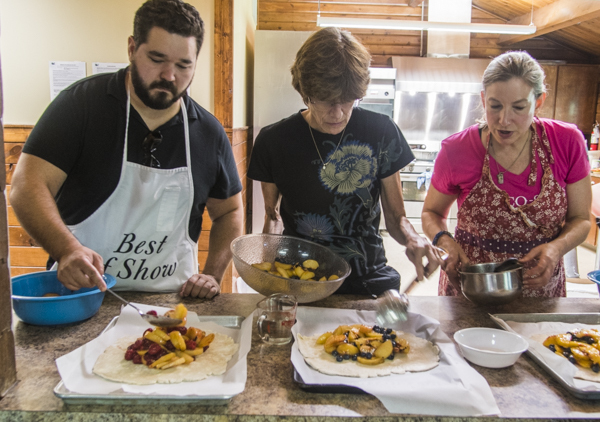 When summer arrives, watch for announcements about registering for Family Camp 2018. Campers join hands for a silent Quaker blessing before a meal at Family Camp. 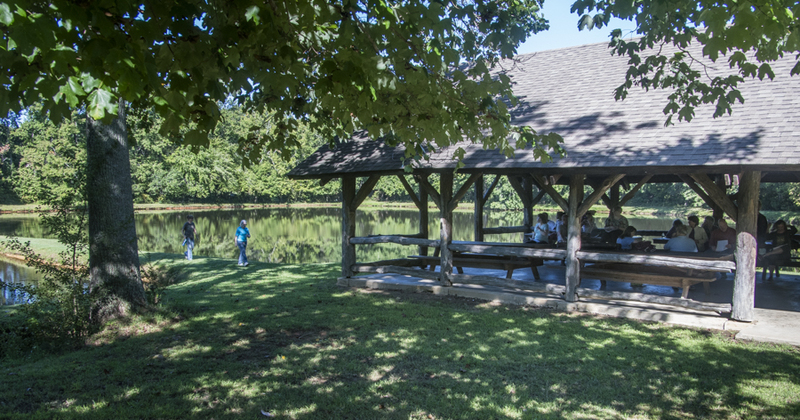 Meeting for Worship takes place in the shelter overlooking the water at Quaker Lake.